Authenticity and scientific significance of a work under review are the main arguments for making a decision about its publishing. Head editor may follow the policy of Editorial staff of “Issues of forest science” journal, may counsel with other Editors and Reviewers (or Scientific community officials) to make a decision about publication. Head editor and Editorial staff of “Issues of forest science” journal should not disclose without necessity any information about received manuscripts to anyone, except Authors, Reviewers, possible Reviewers, other scientific advisors and the Publisher. Any unpublished data from received manuscripts is forbidden to use in personal research, without the prior written consent of the Author. Any information or ideas, gained through reviewing and granting some kind of advantages, should remain confidential and not be used for any personal benefits. Head editor, in conjunction with Editorial staff, takes appropriate measures in any situations, concerning ethical complaints about reviewed manuscripts or published materials. Such measures, in general, include interaction with Authors and argumentation of corresponding complaints or demands, but can also include interactions with corresponding organizations or research centres. Review helps Head editor to make a decision about publication, and might also help Author to improve quality of his paper even further. Any Reviewer, who feels himself not qualified enough for a particular manuscript review, or lacking time for adequate completion of his work, can inform Editorial staff and ask them for an exclusion from reviewing process of the manuscript. Any manuscript received, should be regarded as a confidential document, it shouldn’t be disclosed by any means, or discussed with anyone without a permission of Head editor. Reviewer must be impartial in his judgement and avoid any criticism of Author’s personality. All Reviewer’s comments should be clear and reasoned. Reviewers should, if possible, discover all major publications, with similar subject, that are absent in manuscript references. Any statements (observations, conclusions, arguments) in manuscript should have proper references, if they have already been published elsewhere. Reviewer should also inform Head editor about any significant similarities between reviewed manuscript and other publications, if it is within his scientific competence. Reviewers should refrain from reviewing manuscripts, if a conflict of interests is present due to competitive, cooperative or other relations with any Author, company or other organization behind the received manuscript. Authors must provide reliable results of their work, as well as reasoned discussion of research significance. Data that underlie their work should be present without mistakes. Manuscript should contain enough details and references for possible reproduction. Erroneous or deliberately false statements within it violate publication ethics and, as such, are unacceptable. Author can be asked to provide unprocessed data regarding the manuscript, for review needs. Author should be ready to provide complete access to such information (in accordance with ALPSP-STM Statement on Data and Databases), if it is possible, and also keep this data for an adequate period of time after the manuscript publication. Authors should make sure their paper is original, and if any paper or statement from any source is used for it, it gets a proper reference. Plagiarism of any kind violates publication ethics and is unacceptable. Private data, received via correspondence or personal talks and discussions with a third party, should not be used without a clear written permission from original source. Information from confidential sources (such as manuscripts reviews or grant administration) should not be used without a clear written permission from original source. Author should not publish manuscripts, concerning same research, in more than one journal as an original publication. Sending a manuscript to more than one journal at a time violates publication ethics and is unacceptable. Only a person with a substantial contribution to the development of research or its idea, to its fulfilment or to its interpretation can be named an Author. Every person with a substantial contribution into research should be listed as a Co-author. Any participants who contributed sufficiently into at least one of project stages, should be listed separately as a people, who made a significant contribution into the research. Author should make sure that any project participants, with a significant contribution into the research are listed as Co-authors, and that any Co-author listed actually took part in the research. They should also make sure that all the Co-authors approve the final version of manuscript and agree with its publication. If the work implies use of any substances, equipment or procedures, that involve any special risks, it must be clearly stated in the manuscript. Any financial or other conflicts of interests, regarding the research, should be revealed in the manuscript, if they could be considered influencing the results or conclusions. Examples of such conflicts of interest are: work for hire, consulting, being a shareholder, receiving honorarium, providing expertize, patent application or registration, grant or other kinds of financial support. Potential conflicts of interests should be revealed as soon as possible. 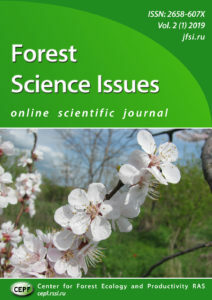 In case of any substantial mistakes or inaccuracies in the publication are found by Author, they may and should contact Editorial staff of “Issues of forest science” journal and cooperate with Editors for the most immediate publication withdrawal or correction. If Head Editor or Publisher received reliable information from the third party about any substantial mistakes in publication, Author must withdraw the paper or correct the mistakes as soon as possible. Publisher should follow the principles and procedures, that motivate Editors, Reviewers and Authors of “Issues of forest science” journal to comply with their ethical duties in accordance with present Rules. Publisher should provide Editors of “Issues of forest science” journal with all necessary support in considering any ethical complaints regarding publications, they should also help to cooperate with other journals and/or Publishers, if it furthers the fulfilment of Editors’ duties. Publisher should contribute to the proper examination of research conducting and introduce departmental standards to help improving ethical guidelines and the procedures of publications withdrawal and mistakes correction. Publisher has the rights to receive dedicated legal assistance (opinion or advice) if needed.